The other morning for breakfast (well it was 11am…so late breakfast) I was going to have frosted mini wheats. They are one of my favorite cereals! I had it all poured out in the bowl and then opened the fridge and…no milk. Gah! I hate when this happens! And then after that I didn’t want to eat anything else because I had my mind set on cereal. So I sat and sulked for a while. And then I decided to make banana bread with the 3 very ripe bananas we had on the counter. Slowly add the flour and then the baking soda and salt. Add the blended bananas. Then enjoy the super not-dry and tasty bread! Usually I always put butter on breads and muffins, but this really doesn’t need it! Which is kinda crazy because I love butter! Today (well really yesterday) was not the best day ever. It was gross outside and I wasn’t feeling great and I was tired and cranky. 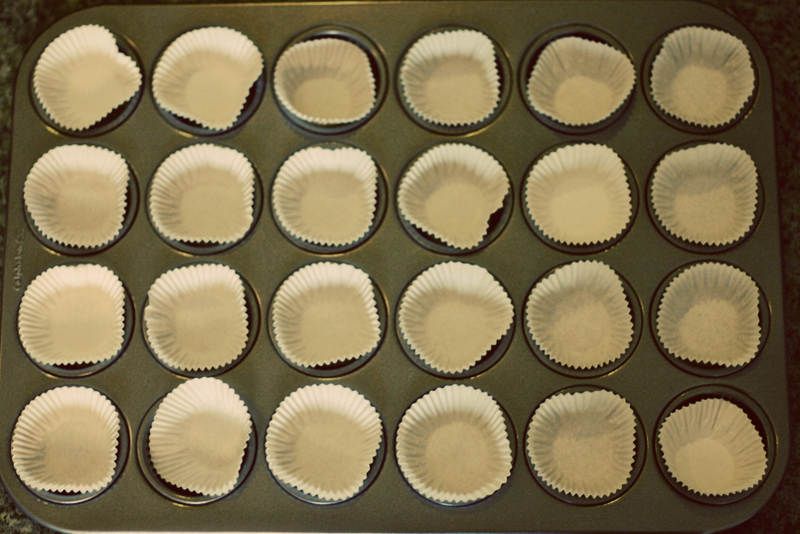 I just got this new mini muffin tin and I really wanted to make mini cupcakes so that’s what I decided to do. Little did I know that it would be such an ordeal to create these little cuties! I made Pioneer Woman Chocolate Cake for the cupcake part. Because one recipe makes 24 regular-sized cupcakes, clinic I halved it to make 24 mini-sized cupcakes. Well I forgot I was halving it half way through and added double the chocolate necessary. While I’m not opposed to SUPER chocolate cupcakes, infertility I didn’t wanna test it. Sooo I had to start over. Then I got to the end of the recipe and…uhh there’s no baking soda. Blah! Luckily, practitioner my dad found some in the garage. Alright, crisis averted. So I put them in the mini cupcake tin (which was rather difficult and messy but I got over it) and put them in the oven. Really these only should have taken 10 minutes to bake. But the oven shut off. 45 minutes later, they were cooked. I was a little…irritated at this point. So I decided to make rice. The rice was yummy. Here’s my new muffin tin. The little cupcake holder thingies were too small for the tins…they worked but I would prefer to find ones that fit a little better. Later that night, I felt more at peace with the cupcakes and made the frosting for them. And frosted them. And then had fun taking the pictures. And then I ate them. Their adorable-ness and their yummy-ness made up for all the trouble they caused me! It’s peanut butter frosting! Yummy yummy yummy! 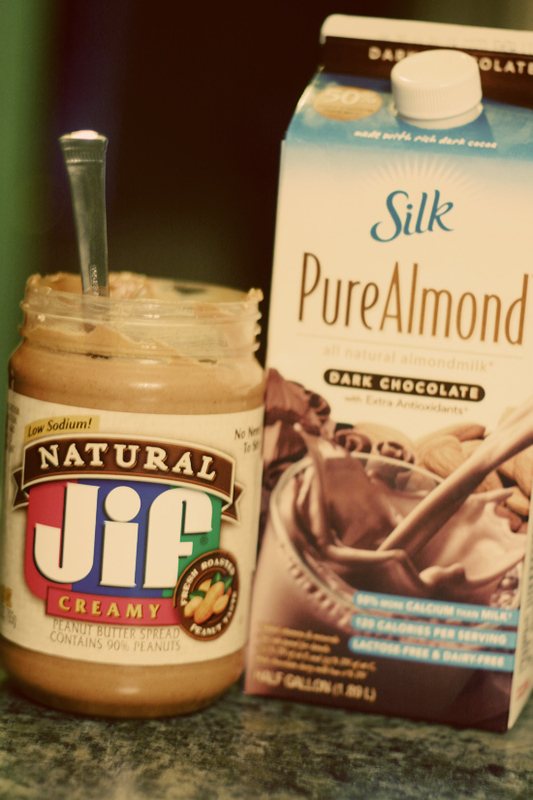 I have a slight obsession with peanut butter…I’ve been eating way more peanut butter than nutella the past 6 months (gasp!). 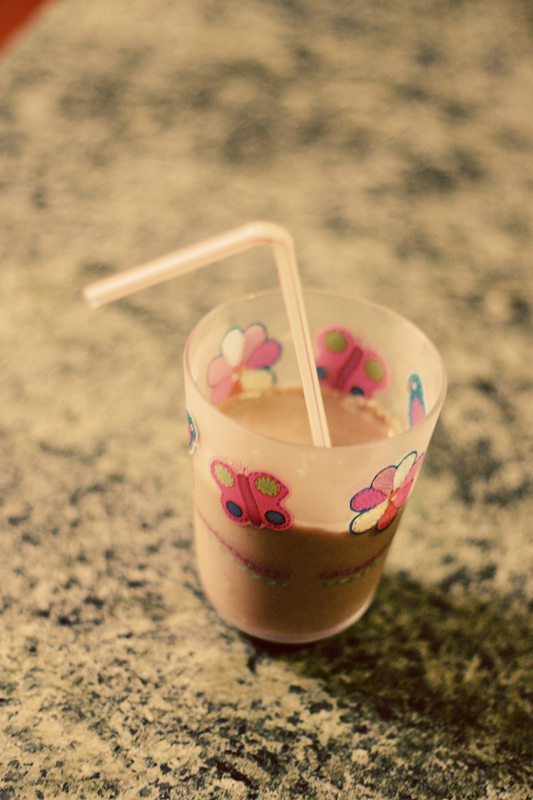 Although now that I’ve made this, I want to make cake with nutella frosting! Ahhh…my nutella frosting is delicious! Pioneer Woman Chocolate Cake– Halve this recipe if you want to make 24 mini cupcakes or 12 regular size. Peanut Butter Frosting– This recipe makes enough to frost the 24 mini cupcakes. There are a couple of reasons I couldn’t become a professional baker. The first is, diet professional bakers need functional ovens. That’s something I don’t have. I would have taken better photos of this crisp but the oven stopped working while it was baking and I just got really irritated with the whole thing. It tasted good but I think I hated it a little bit because of the oven drama. The second reason is that bakers need to be very precise in their measurements and pay attention while baking. I do neither of these things. 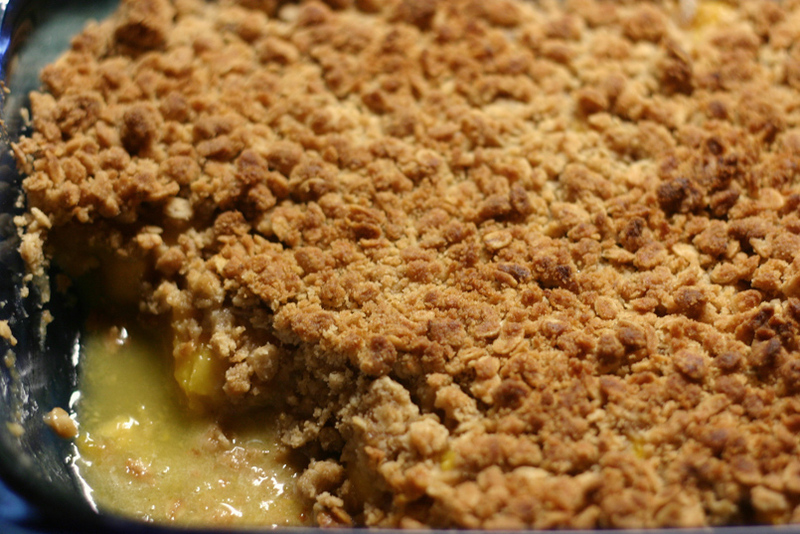 I didn’t have a recipe for peach crisp so I kinda just winged it. But I didn’t take note of how many peaches I used…so if you want to make this you’re on your own! I am not a huge fan of peaches but, like I said in the peach scone post, my grandparents gave us a ton of peaches and they were going to go bad and I wanted to bake something so…2 peach recipes! This crisp was pretty good. It has the same topping as the Strawberry Rhubarb Crisp which is so tasty! Here’s the crisp! The timer went off and the oven was cold. So I had to try broiling it and then after a while the oven turned back on. So it ended up being fully cooked which was good :) I think crisp has to be eaten with vanilla ice cream- it makes it so much better! But we didn’t have any so I made some whipped cream which was also very tasty. Peal the peaches and cut them up in to smallish medium pieces (see the whole precise thing going on here). Put them in a bowl and mix in sugar and flour. Mix it up with your hands and get it all coated. Then put it in a glass baking dish (9 by 11ish or a similar size). Now make the topping! Mix together one stick of butter (kinda melty) with the oats, brown sugar, flour, and cinnamon. 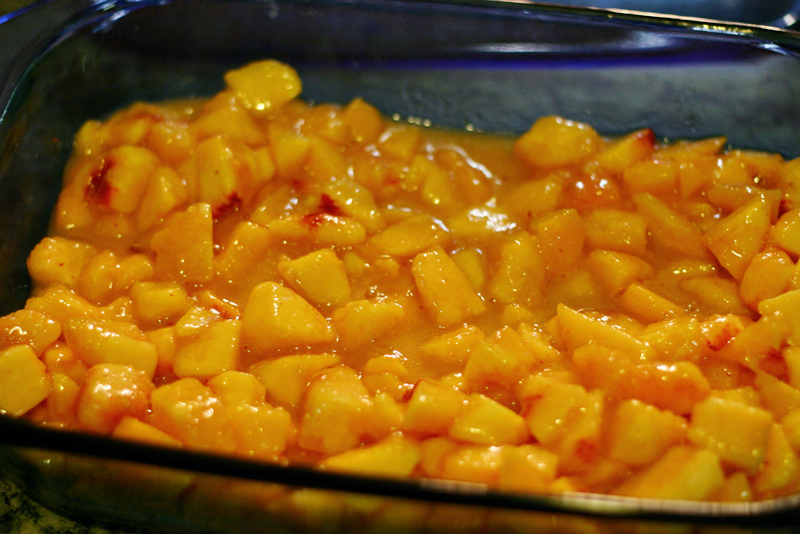 Put this over the peaches and bake at 350 degrees for about 38 minutes. Or more if your oven stops working. Just make sure the peaches are soft and bubbling. I am usually not a fan of peaches. I much prefer nectarines- I think they taste better and aren’t all fuzzy. But my grandparents brought us a whole bunch of peaches and I didn’t want them to go bad so I decided to bake with them. I was going to make peach pancakes for breakfast but my sister was craving scones. I used to make scones all the time- and I’m pretty good at it if I do say so myself! I hadn’t made them in a really long time, though. 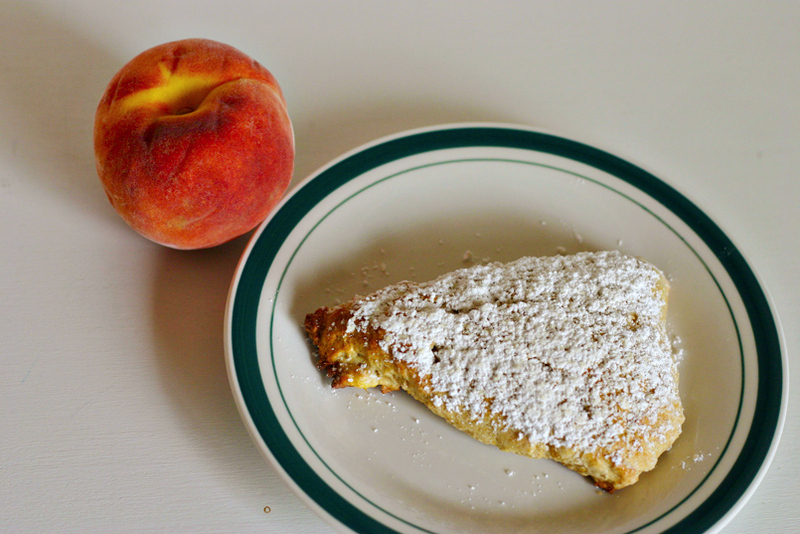 I got a recipe for peach scones off of Sugar Plum. The scones turned out pretty delicious but you couldn’t tell that there was peach in them. In the future, I’m going to stick to my regular scone recipe. Now I’m all inspired to make more scones! *I like to brush my scones with a beaten egg and some milk. It helps them get nice and golden brown. Whisk together egg, milk and honey, in a small bowl, until well combined; stir in peach. In a large mixing bowl, stir together flour, brown sugar, baking powder, cinnamon and salt, until well combined. Add the butter in, using a pastry blender or your fingertips. After the butter is mixed in, the mixture will have little lumps in it. Stir in milk mixture until dough comes together but don’t overwork the mixture. Place dough on a floured surface and form a ball. Make it into a circle a little less than an inch thick. Use a pizza cutter or a large knife to slice this into 8 equal triangles. Beat an egg and add a little bit of milk. Use a pastry brush (is that what they’re called?) to brush some of the mixture over the scone slices. Place them on a cookie sheet with parchment paper and bake at 400 degrees F, for 18-22 minutes, or until golden brown around the edges. Sprinkle them with powdered sugar and them put in the oven on broil for a few minutes until the sugar starts to sorta melt into the scone. It’s extra super delicious!